I would not characterize myself as into holistic medicines and remedies but I guess I must be one of those hippy types after all. Whenever I have skin problems I veer towards natural and simple skincare. The motto that applies to 95% of all my problems is: Natural is good and the fewer ingredients the better. So, to quickly sum up the skin ailments that are affecting my life I've listed them below as concisely as possible. 1. Jellybean's ashy dry skin. 2. Gummybear's baby eczema spots. 3. 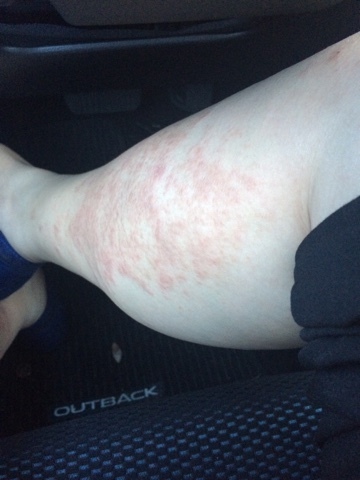 The itchy, bumpy, thick rashes on my calves from my first pregnancy. 4. Enlarged and clogged pores and dull skin from ditching face routines after having kids. 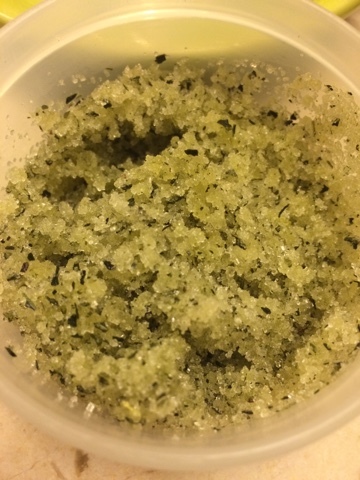 This is my DIY moisturizing green tea sugar scrub for the face. I use it to tackle problems #3 and #4. The ingredients are sugar, green tea, and olive oil. As an exfoliant it has done wonders for my skin in buffing away the dead skin cells and even managing to slightly shrink my larger pores. Also, it has helped with clearing the surface congestion on my nose. After using this the left over olive oil locks in moisture so that my skin stays slightly damp and ready for moisturizer. I've been getting lazy lately and have used this scrub with Johnson's Head-to-Toe baby wash. I drizzle a little bit of baby wash into a palmful of sugar scrub, then slather it on my face and neck. The baby wash washes everything off but the little bit of olive oil that remains keeps the skin from getting too dry. But it's definitely not as effective as when I use the scrub by itself, so I'd recommend to not skip moisturizer. 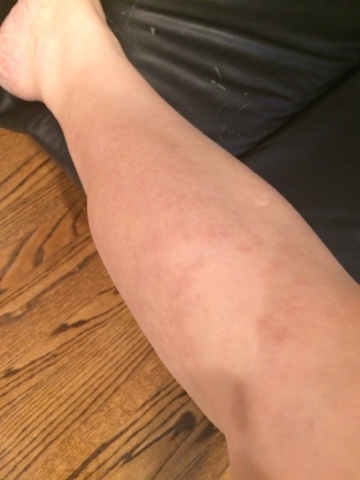 On my legs the scrub has sloughed off the thickened dead skin cells and left fresh skin ready to drink up the thin layer of olive oil I rub over it. Here's the before picture below. And here's the after picture below. The scrub took off the top layer of flakey skin so that the olive oil could work its magic. It didn't happen overnight. It was more like a "heal from within" type of thing. With my kids, they're tickled by the scrub so I don't use it on them. But I do rub olive oil on their problem spots. It takes a couple of days, maybe 2 weeks, but all of Gummybear's problem areas are cleared up. No rough patches and no flakes. Jellybean's dryness is a result of her class being persnickety about washing hands. They wash hands for everything, which isn't a bad thing, but her hands are so dry it's just not natural on a 2-year-old. So I mix olive oil with the baby wash during her shower and I put olive oil on her skin afterwards. The oil absorbs into her skin plumping it up with some moisture and there are no fragrance or preservative ingredients like in traditional moisturizer to irritate her skin or leave bad tasting residue behind. We just started her skincare regimen a few days ago so we have yet to see lasting improvement. But that's ok. The thing about natural remedies is that they take time to work their magic but they do work. I hope you all will give it a try. Thanks for reading!